Fresh pears in the middle layer of these simple bar cookies make for a fruity surprise. For bar cookies: Combine flour and salt; cut in shortening until crumbly. Stir in about ½ cup milk, one tablespoon at a time, until all flour is moistened. Divide dough in half. Roll out half dough to 17 x 12-inch rectangle. Carefully place in 15 x 10 x 1-inch baking pan. Sprinkle with bread crumbs. 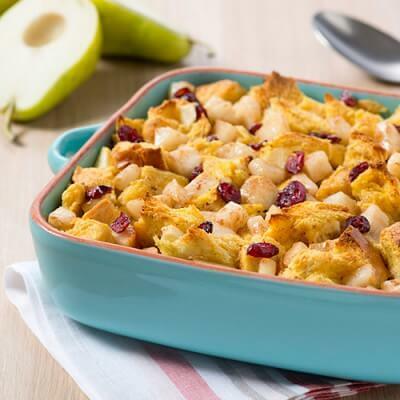 Arrange pear slices over crumbs. 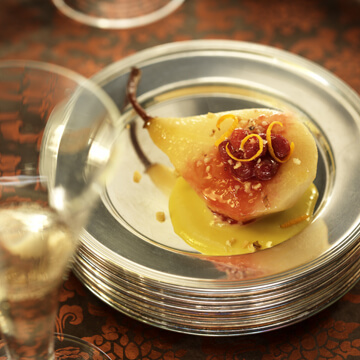 Combine sugar and orange peel; sprinkle over pear slices. Roll out remaining dough to 15 x 10-inch rectangle and place on top of pears; seal and flute edges. Cut several steam vents in top of crust. Brush top of pastry with milk. Bake at 375 degrees for 45 to 55 minutes or until pastry is golden brown. Brush with glaze while warm.